I wonder why iPAQ is named iPAQ? It used to be from Compaq, so the PAQ bit could be from there, but why iPAQ? It's so similar to ipod! I'm sure imac came before iPAQ, but where does ipod fit in? I think it was after iPAQ. Chronologically, imac - ipaq -ipod??? Anyway, my ipaq can double as ipod! It has 1GB storage space, so it can store music and movies! It can store even more via SD memory cards. 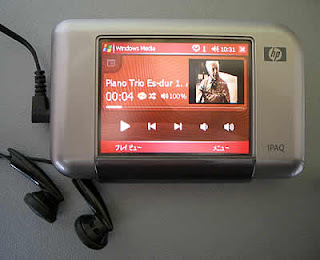 iPAQ is a lot more than a 'simple' music player ofcourse, with email and web browsing capabilities via bluetooth and wifi. I was on GNER train the other day, it said it has onboard wifi, so I took a peek. The GNER website was free to browse. Not bad. But other than that, not much of an entertainment. For me, it only costs few pence to send/receive email via my mobile & Bluetooth on my ipaq, so I didn't go for the couple of pounds per 30 mins option! So as my ipaq might say - i'm PAQed with features! ?